One of my favourite things to get at breakfast joints is eggs benedict. 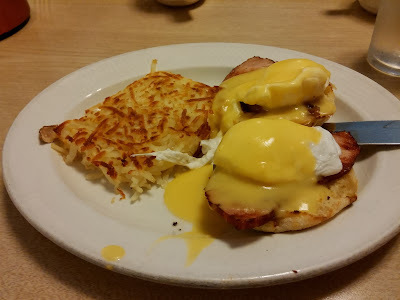 At IHOP there was only one eggs benedict option on the menu which is understandable because it specializes in pancakes although it has branched out to all types of breakfast items and even lunch. The eggs benedict was all right. The eggs were poached but was one of them was slightly overcooked. I think I preferred the hashbrowns over the eggs. The potato strips were slathered in butter then fried making them extremely savoury but poor for the health.